The obvious conclusion is that investment is very important for the business cycle. Should we be surprised? No! It's common knowledge that although investment and consumption are both correlated with GDP, investment is far more volatile - in other words, investment makes up a very outsized portion of business cycle swings. And in fact, this is exactly what theory would predict - since capital goods are durable, it's relatively easy to shift purchases of capital goods (i.e. investment) into the future or into the present. Sorry, but this just doesn't follow. Taylor seems to have in mind an RBC-type model, in which the business cycle is driven by supply shocks. 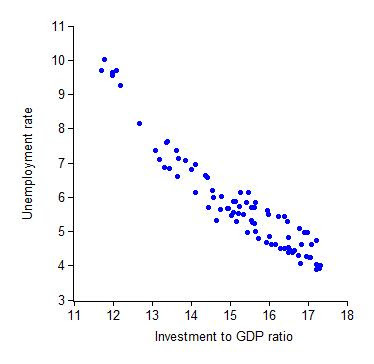 But his graph in no way implies that we are living in a supply-driven world, because demand-based models also imply that investment and unemployment are inversely correlated! This is a clear result of the standard New Keynesian macro models, for example (see Woodford 2005). In these models, investment is low when aggregate demand is low - if customers are buying even a little fewer of the goods that firms sell, it makes sense for firms to delay much of their purchases of the capital equipment that they use to produce their goods. The way for policymakers to boost investment, therefore, is to boost aggregate demand, by printing money and buying stuff - or, in some models, by having the government borrow and spend money. 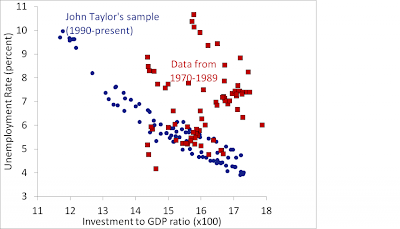 Thus, Taylor's graph is perfectly consistent with a world in which expansionary government policy is exactly what we need. Paul Krugman also basically makes this point. Anyway, thinking about investment in the context of New Keynesian models made me realize something. John Taylor is just drawing a Phillips curve! A Phillips curve is a curve that shows an inverse correlation between inflation and unemployment. And in New Keynesian models, inflation and investment go hand in hand - when the economy is booming, prices rise. So a New Keynesian would expect to see something just like what Taylor drew. I then noticed that John Taylor's curve covers only 1990-2010. If Taylor's curve is in fact just a Phillips curve, then if we extended the time period we'd expect to see a series of several nested curves, with the 70s and 80s being farther to the upper right. Looks familiar, right? 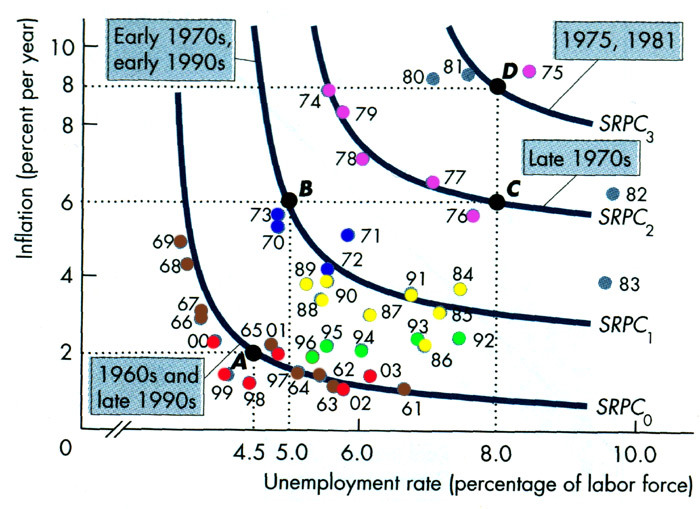 Somehow I'm guessing Taylor probably didn't set out to redraw the Phillips curve...but that's what he's done. 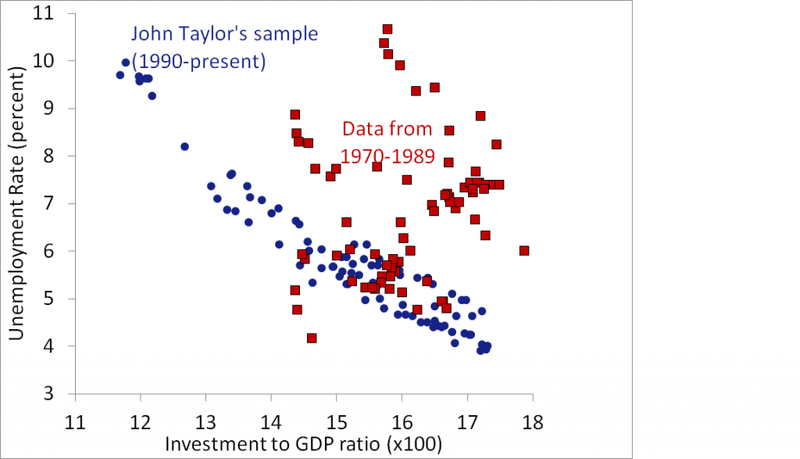 To reiterate, Taylor's graph is perfectly consistent with a world in which demand shocks drive the business cycle and demand-side policy is the key to stabilizing investment. His supply-side conclusions are purely a function of his assumption that we live in an RBC-type world. But there are good reasons to think he's wrong. For an argument as to why New Keynesian models are better than RBC models, see this 1989 paper by...Greg Mankiw. Update 2: For a great primer on Phillips curves, see Brad DeLong. I don't think Taylor has an RBC-type model in mind. I read his argument as positing a demand-side effect that works through investment, much the way that Keynesian policies such as countercyclical investment tax credits are supposed to work. For that matter, this is also the way that monetary policy works in traditional Keynesian models. If reductions in taxes and regulation increase the incentive to invest, that's very much like reducing the cost of capital by cutting interest rates -- which is not normally regarded as a supply-side policy. "investment is far more volatile - in other words, investment makes up a very outsized portion of business cycle swings"
"investment is far more volatile - in other words, investment CAN make up a very outsized portion of business cycle swings"
That graph is begging for a z-axis of time. Potentially showing the Phillip curve morphing thought time.